WORLD ORAL HEALTH DAY 2014: 6 WAYS TO GET RID OF MOUTH ODOR/BAD BREATH! Today is World Oral Health Day and in celebration of that, we need to examine our oral hygeine. 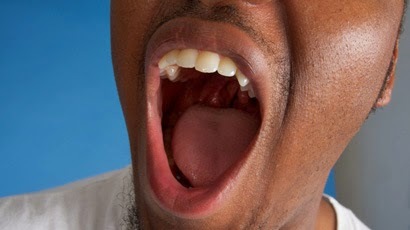 A common problem is bad breath...do you know how many toasters bad breath has chased? Do you know how many people have lost contracts due to bad breath? Don't let it happen to you! The first point of call would be to check your oral hygeine: do you brush regularly and when you do do you brush your tongues?? It is recommended you brush twice a day, ypou will see the difference. Do you floss? Food can become lodged bwteen our teeth and can cause it to stink over time. You should also regularly use a mouthwash. Your breath will be fresh! You need to avoid the following offenders : onion, garlic, tobacco, coffee, etc. which is one of the best way to avoid food-related bad breath. Vitamin C can helps to prevent gum disease and gingivitis which are the major causes of bad breath. By eating foods rich in vitamin C bacteria cannot grow. Eat citrus fruits like oranges, berries and even melons to get your share of vitamin C.
There are certain You can also chew parsley, which seems to curb offending smells from other foods and bacteria. And cranberries may eliminate offensive smells and make the bacteria less sticky, which makes plaque less likely to form. Price says sugarless gums that contain xylotol may kill some bacteria and help reduce plaque. Did you know dehydration is one of the most common causes of bad breath? Think about how stinky your mouuh gets when you're fasting...it's because you're not getting enough fluids and this is partly responsible for bad breath. I hope this helps! Do you have any remedies for getting rid of bad breath? This mouth odour is a serious son tin, how do I tell my boss he has mouth odour? Oil Pulling is very effective. I tried and find it very refreshing. My wife don't want to leave the bed after I was relieved from halitosis. Oral health is something to be aware of for 365 days. According to a dentist in Chandler, children who grew up with good oral habits has a higher chance of being happy adults in the future.